Nickolas Muray, 1892-1965, American (b. Hungary), Frida with Olmeca Figurine, Coyoacán 1939, Carbon process print. Courtesy of the collection of the Nickolas Muray Archives. Tour Development by Smith Kramer Fine Art Services, Kansas City, Missouri. PALM SPRINGS.- Approximately forty-six portraits of Frida Kahlo and three letters she wrote to Nikolas Muray comprise this exhibition. The photographs, dating from 1937 to 1941, were taken by Nickolas Muray, Kahlos friend, lover and confidant. 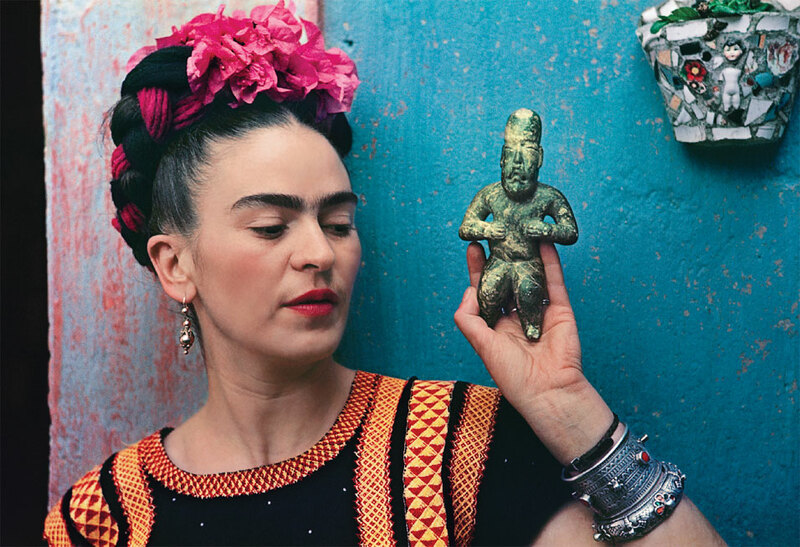 Muray began photographing Kahlo in color in the winter of 1938-1939, while she was in New York attending an exhibition of her paintings at the Julien Levy Gallery. Muray photographed Frida more often than any other single person and his compelling photographs bring to light Kahlo's deep interest in her Mexican heritage, her life and the people significant to her. Nickolas Muray (1892-1965) came to America in 1913 from Hungary. During Muray's forty-five year career as a New York photographer, he developed a growing reputation that began during the decade of the 1920s when he photographed notable figures from high society. At the time of his death, most Americans had seen, at one time or another, Muray's portraits of celebrities, presidents, or advertisements that were regularly featured in Harper's Bazaar, Vanity Fair, McCall's and the Ladies Home Journal. Muray and Kahlo were at the height of an on-again, off-again ten-year love affair when he began photographing her using the Carbro technique. Their affair had started in 1931, after Muray was divorced from his second wife and shortly after Kahlos marriage to Mexican muralist painter Diego Rivera. The love affair outlived Murays third marriage and Kahlos divorce and remarriage to Rivera by one year, ending in 1941. Muray wanted to marry Kahlo, but when it became apparent that she wanted Muray for a lover, not a husband, he took his leave for good and married his fourth and last wife. He and Kahlo remained good friends until her death in 1954. The presentation of this exhibition at the Palm Springs Art Museum is part of a national tour over a two and a half year period comprising forty-six photographic prints reproduced from the original negatives. The exhibition, courtesy of the Nickolas Muray Archives, was developed by Smith Kramer Fine Art Services, Kansas City, Missouri and is funded in part by a grant from the James Irvine Foundation. Funding for the Happy Birthday, Frida! community day is provided in part by Donna and Cargill McMillan.